Upon queueing up the tracks of The Weakness of Virtue, there was a moment of daunting pause looking at the overall length. A doom/death release with 68-minutes of material, bookended by cuts that went over the 10-minute mark. Rare is the band that can sustain interest for that extended length, particularly when it pertains to the tried-and-true varieties, but Soulmass manage to do exactly that on their second full-length. The Weakness of Virtue sits comfortably in its relationship of both death and doom metal. Described with the Dark Souls series as influence to their sound, there is a grittiness and heft to the material that swings between more straight-ahead stompin acts like Bolt Thrower and Hail of Bullets along with the gloom and desolation of Novembers Doom and Candlemass. Hence there’s some immediacy with the material that meshes nicely with some more eloquent and darkly dreamy passages. There’s a great sense to the flow of each track as well. They take the time required to really build things up and sustain a mood, but don’t overdraw on the emotions (particularly the opening and closing numbers). Along with the variety of more uptempo raging/grooving (“Blacksmith’s Wisdom”) with doomier progressions (“The First Sin”), there’s a surprising amount of replay and investment for an album of this type. Chalk it up to some masterful melody writing, particularly in the doomier side of things. There’s something to catch your ear and take notice, each and every time. 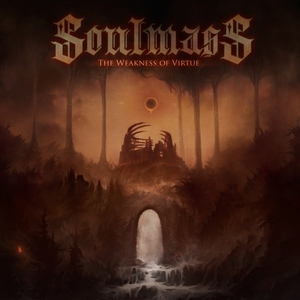 A powerful and suitably dreary record that impresses with its attention to detail, Soulmass hit all the death/doom marks with The Weakness of Virtue. Strong dynamics, interesting riffs and melodies (not to mention the potent vocal roars), and really nailing the desolate and grimy Dark Souls vibes, there’s not much to complain about with this one for genre fans.